As a part-time dabbler in electronic music production (read: I mix tunes for my own amusement, and a couple uploaded here and there) I have a few programs that I bounce around from depending on the purpose I need, but generally speaking I don't really muck around a lot with things, and I tend to prefer to just simply mix two songs together live and on the fly, record it, and win. Another thing that I do musically online, and have done since for a number of years on and off, is DJ for various shoutcast based streams, ranging from electronic music to death metal. Again, you can do this, running just about any GNU/Linux system, surprisingly easily for even just playing around for fun. I introduce to you: Mixxx. Mixxx is (according to some, others will disagree) near-professional level DJ software, allowing you to (maybe not) live your DJ dreams of mixing an underground rave in Ibiza. While Mix is Cross-Platform, I rarely see Windows users using it, and tend to find it predominately used by GNU/Linux users, from my own experiences. I use Mixxx anytime I am in Linux and want to spin music. Its worth noting, that Mixxx can be very simple to use on the surface, but if you tie it in with things like JACK sound server, multiple external hardware pieces, etc., Mixxx does have the capability to be extremely powerful. It also has an extremely extensive options/preferences menu, for those who want the depth to customize. 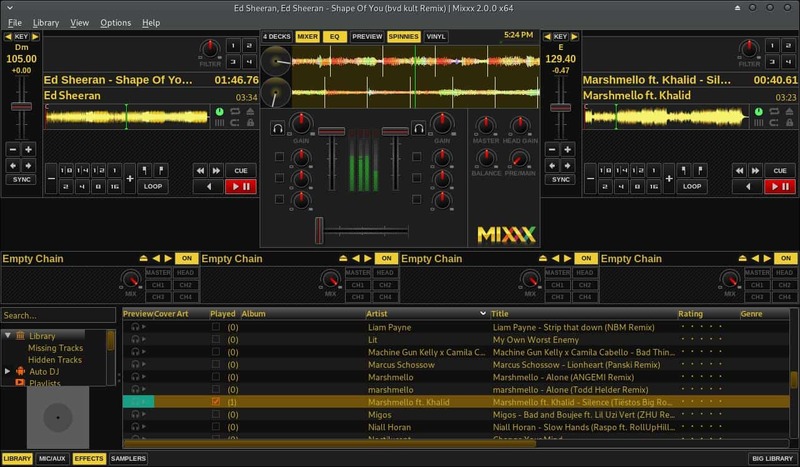 Mixxx is a great free alternative to popular programs like Traktor, or Virtual DJ, and is completely compatible with GNU/Linux systems, so if the need ever arises, it’s definitely worth checking out. The cross-platform software program is available for Linux, Windows and Mac OS X, and it may be worth a shot even if you have no desire to start a career as a local club DJ. It may very well be a handy program for the next party or even smaller events, even if you don't use most of the functionality that Mixxx has to offer. Now You: Do you use DJ software? Mixxx is (according to some, others will disagree) near-professional level DJ software, allowing you to (maybe not) live your DJ dreams of mixing an underground rave in Ibiza. Thank you, Mike, Looks like the real deal. I am going to take a good hard look at it.